– The product dimension is hand-measured, might not be that accuracy. – Color may not appear exactly as in real life due to variation between computer monitor resolution and lights. – For the adults over age 18 and DISPLAY ONLY. A MUST HAVE!!!! WOW!!! WORTH IT!!! ok nerding over. I unboxed this sword in a foam box. Nice touch I like the complete foam box. The sword is incredible. I am a difficult person to impress when it comes to swords. But this sword. For the price, it equals a sword I have for 4 times the price. The sword is incredible, sharp, tight no rattle, great weight and balance and you can tell it was hand sharpened which make me love it even more. I can see all the imperfections that bring out its beauty even more. I love it. 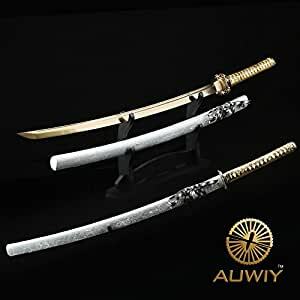 Auway swords where have you been all my life. Very nice Katana. I chose the rose tsuba with light yellow ito handle wrap and light toned wood saya (scabbard). Really nice look, contrasting nicely with my black corded and finished swords. The handle is slightly shorter than some Katanas, but still allows a good two hand grip. The tsuba is a bit thin black alloy, with the rose figures done in gold. The whole effect is of elegant simplicity, rather than garish display. Blade is fairly sharp, but could be honed razor sharp. No hamon line, but it had the hi (fuller) on each side. It comes heavily oiled, but this is easily wiped off. I then apply a thinner film of good quality light oil for rust prevention. My home in Florida is often a humid environment. Weight and balance are good, handy and easy to wield. Not sure about the steel, as different sources say “T10” or “1060” steels. This sword is more for display than use. I am happy with it. A nice sword for the price. The pics show 2 mekugi but I have been unable to find a second one in the hilt. Description says full tang but without that second pin I’m hard pressed to believe it. I haven’t tried taking the sword apart since it is constructed tightly though. I wish the seller would show the sword apart in the pics so buyers can see the tang before purchasing, or at least a sample of it. THE RED ONE ORCHID TSUBA: Tough, sharp, and well balanced this katana is really good for practical purposes. But does NOT have hamon, real rayskin, or really nice ornament “menuki”. But its red blood spattered scabbard “saya” and its synthetic red rayskin and brass guard “tsuba” Look really nice for a really GREAT price. Cuts very nice. Ive tested it on mats, bottles, fruit, cans, wood”NOT RECOMMENDED”, and against another sword “DEFINITELY DO NOT EVER DO!” though it survived really good through it all the only damage to it…. Was the sword vs sword. It left a good little chip on it 🙁 BUT! Ive sanded and polished the chip and now looks better than it first was 😀 but seriously for such a great price for a 1060 high carbon steel battle ready sword. Its WORTH ALL OF IT! And if this is your first sword you will start off RIGHT! Purchased for my boyfriend for Christmas and he was so happy with it. He spent time in Asia when he was younger and this brought back memories for him. He says it is excellent quality and definitely worth every penny. The blade even came oiled and sharp which I thought was nice. Overall I would recommend this to people wanting something authentic and high quality. This sword is very well made. It has solid construction throughout and comes fairly sharp. After several test cuts the blade is still in very nice condition and was able to cut through the targets very well. Even after over cutting and hitting a very hard object the blade did not bend or break. Also the tsuba and handle did not come loose which is very nice. I would highly recommend this as a low cost katana that is good enough to practice iaijutsu and battojutsu. Sword has arrived well packed and for a display piece looks very nice. The saya is exceptionally tight fitting once the sword is fully sheathed, hopefully that will loosen up with use. Oddly I found only one mekugi pin securing the tsuka to the tang of the blade….not sure if the second is obscured by suka-ito wrap. If the second pin doesn’t exist I wonder if the sword really has a full tang.